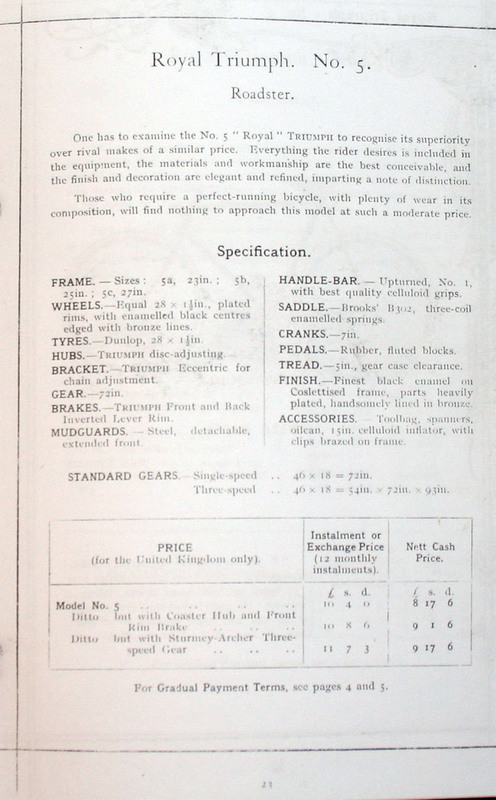 In the years following the turn of the century, various brake options were offered by cycle manufacturers. Plunger front brakes and rear band brakes were very popular at first, and coaster brakes were common too. But, by 1914, rim brakes had become the industry standard. A 1914 Royal Triumph is undoubtedly a very fine machine, made to the highest standards of any cycle manufacturer. But it was not at all ‘modern’ in its day. Most of the model range was still fitted with inverted brake levers, whereas all the other manufacturers had upgraded to roller levers by now. And, perhaps surprisingly, the two top-of-the-range Imperial models on offer in 1914 featured band brakes. The Royal did not have a band brake as standard. But this particular machine was fitted with one as an option at additional cost, and it is cable operated by the left-side handlebar inverted lever. In the perverse world of collecting, a century old machine with anachronistic features is doubly interesting. Although a band brake is not an efficient braking system in the longterm, as it required more maintenance, Triumph’s ‘old-fashioned’ cycle styling is particularly attractive nowadays. 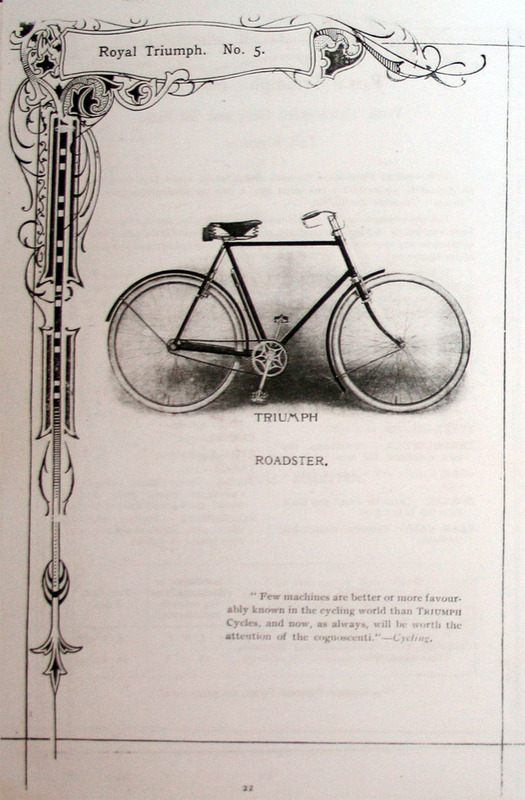 And, despite the high price, the Triumph was also a popular bicycle at the time. 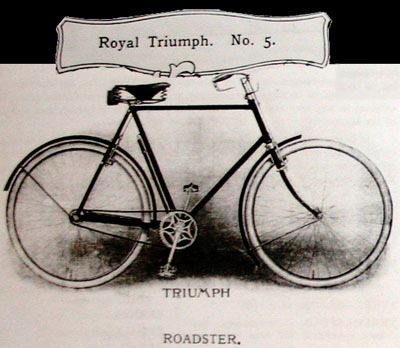 Since the first ‘motor bicycles’ made their debut on British roads around 1902, the respected Triumph name earned even greater accolades for their high standard of workmanship. With added speed and strain on frames and components, motorcycles were made to higher specifications than bicycles, but customers believed that the Triumph company made their bicycles as well as they made their motorcycles. 1914 was really the turning point for the Triumph motorcycle, as the ‘Trusty Triumph’ proved its value during wartime use, and Triumph came out of the war to become Great Britain’s largest motorcycle manufacturer. Possibly because of their primary focus on motorcycle production, Triumph bicycle design was not updated (eg roller levers) until after WW1. Because it was an expensive bicycle, no doubt most of its customers were older gentlemen in any case, and a ‘traditional’ design would have been acceptable. Although the front brake activates immediately, there is a slight delay on a rear band brake. The rear brake cable stretches a long way and, once pulled, it must compress the leather bands to force them down inside the brake drum, where they expand to the sides of the drum to stop it turning. When riding the Triumph, its hard to resist the temptation to keep putting on the rear brake! The bike itself is in remarkable preserved condition, with both its head transfers, the ‘Royal Triumph No 5’ transfer on the seat tube and the Triumph name on the rear mudguard all in first class order. The nickel parts have started to corrode, but are still very good. The paintwork and its box lining are exceptional.